It seems that every season there is an abundance of new ultralight camping equipment on the market, and while I do love me a titanium spork or french press, I feel like outdoorsy folks can be a bit obsessed when it comes to the weight of our equipment. Now, mind you, if you are packing 3 days worth of kit into your pack then the following probably won’t pertain to you (more on ultralight gourmet cooking in a future article!) With all of this said, let’s talk about cast iron. Why cook in cast iron? It’s heat retention, flexibility of use and ease of cleanup cannot be beat. If you want to cook acidic based sauces or soups (not recommended with regular cast iron) simply use an enameled cast iron pot. I usually bring along several cast iron cooking implements including a skillet (or two) and an enameled pot. Skillets are perfect for cooking pancakes and eggs and enameled pots are perfect for soups and stews. Cast iron is also incredibly durable and will always be a great investment. Lodge brand cast iron is ridiculously affordable, so buy several. I recommend a 10 inch, 12 inch skillet and a deep skillet combo that comes with a lid. Enameled cast iron can be very expensive, but I consider them “heirloom” quality, meaning if taken care of, you will pass them down to your grandkids. 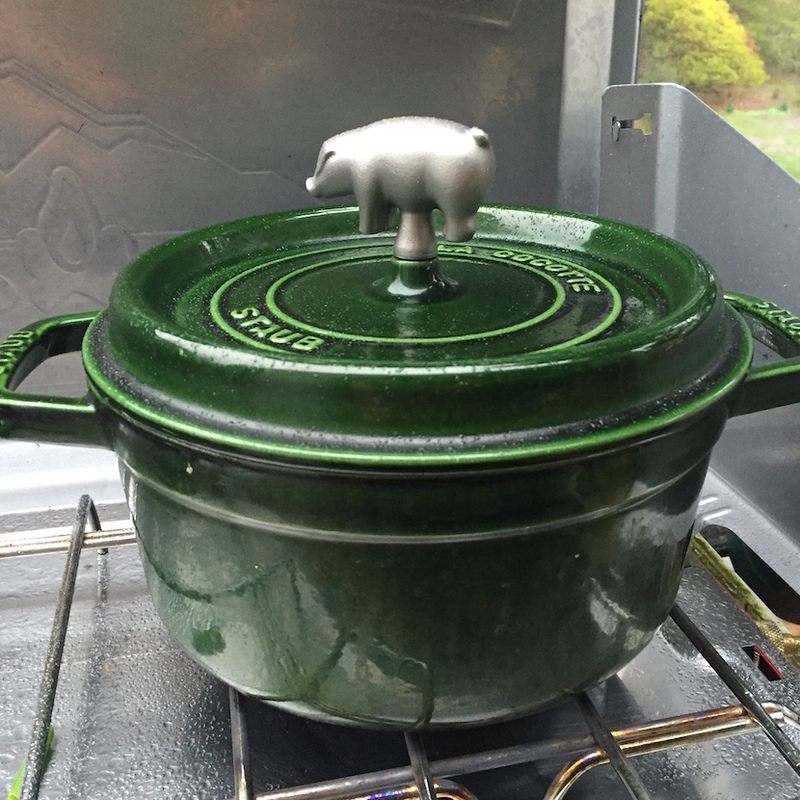 I currently use a Staub 3.5 quart round enameled pot for camping. It wasn’t cheap but look for sales and coupons at larger kitchen supply stores like Williams Sonoma and you can get one for sub-$150. Downsides to cast iron? Simply put, weight. These suckers are heavy and as mentioned before are not appropriate if you are carrying your gear very far from your vehicle. When packing for our trips, I wrap my skillets and pots in paper bags and put them out of the way under the seats of the car. Do yourself a favor and get some cast iron, your camp cooking repertoire will thank you, I promise! Now, to celebrate the cold winter season we are entering into, a perfect soup for a perfect pot, Kimchi Beef Stew. This warming stew is inspired by the Korean recipe for Kimchi-guk and is one of the best stews for chilly weather. I use my enameled Staub for this and it keeps the dish hot which in turn will keep you nice and toasty. A few notes before I give you the recipe: You can add pretty much any veggie to this dish (root vegetables and asian leafy greens are absolutely perfect) and you can vary the spiciness by adding more or less gojuchan. And speaking of gojuchan (Korean brick red chili paste) if you haven’t any in your cupboard, get thee to an asian market post haste! It is one of the most amazing condiments you will ever use. You can also vary the meat you use; chicken, beef or pork, whatevs! And if you don’t like tofu, leave it out. Or if you are vegetarian, add more and leave out the meat. The variations of this dish are endless. We’d love to hear how you made this stew your own, enjoy! 1. Place kimchi (with juices), onion, beef, gojuchan and sugar into pot, add water and bring to a slight boil. 2. Add chicken stock and simmer until beef is cooked. Add tofu and cook for 10 minutes. 3. Top with green onions and serve with rice or udon noodles. Slurp and enjoy! Tanuki (Nyctereutes procyonoides viverrinus) are also called the Japanese Raccoon Dog for their unique appearance. In Japanese folklore Tanuki are known to be jolly, mischievous and masters of disguise able to shape shift. Tanuki love to have fun and are often depicted wearing a hat for all kinds of weather, big eyes, bushy tail and holding a sake bottle. Our Tanuki, Polly Taylor grew up in the Cabinet Mountains of northwest Montana, learning from a young age that there were many tasty things that lived in the woods. From huckleberries to shaggy mane mushrooms to venison, she cut her teeth on wild foods and has never turned back. Now living in San Francisco, she hones her culinary skills by combining foods from her forays with the bounty that northern California agriculture allows her. Her inexhaustible love of the outdoors means that at any given moment you may find her harvesting mussels from Tomales Bay or munching wild berries on the trail with one or more of her three cubs.